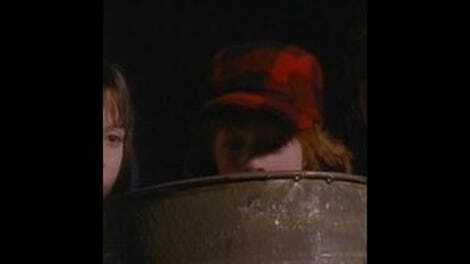 “Sick Day” is the last episode of The Adventures Of Pete And Pete in season two, meaning it marks two things. One is the last episode available on DVD, meaning I’ll have to watch season three illegally (gasp!) to review it. (Call your congressmen to protest Nickelodeon’s injustice.) The second thing is the shift of the show toward, dare I say it, some lackluster territory. Like pizza, of course, any Pete And Pete is good Pete And Pete, but there is definitely a difference between good and not so good. Reportedly Will McRobb and Chris Viscardi, the show’s creators, thought that the series would be over after season two so they kind of went for broke, story-wise. Once they got renewed for a third season, they had to scramble a little to make stories, find profound messages, and somehow deal with the fact that Big Pete wanted to get a really, really stupid haircut. Of course, “Sick Day” isn’t in season three, so we might as well revel in its general goodness while we can. It’s an episode featuring not one but four pretty good cameos—Chris Elliott, Bebe Neuwirth, Velocity Girl vocalist Sarah Shannon, and NCIS LA star LL Cool J—and a storyline about Little Pete getting something stuck up his nose, which is always good. It also includes copious references to plaque candy, the little tabs that dentists give kids to chew on so they can see where tartar is in their mouths. I don’t even know if dentists use that anymore, but it’s a funnily specific thing to talk about, so I’m all for it. In “Sick Day,” Little Pete fakes sick by virtue of a contraband label for expired tapioca. Lured outside by the siren song of the Excalibur 2000 garage door opener, he delves into a world of minor dangers, ultimately becoming fascinated with Glenn Wertle, his classmate who eats the aforementioned red candy. As it turns out, Wertle also once had a marshmallow president stuck up his nose—Van Buren for Wertle, Eisenhower for Pete—and teaches Pete to get it out using static electricity. Fair enough, right? Ultimately, Pete realizes that faking sick, while fun for a little bit, keeps him away from his friends and interests at school. While it’s neat to listen to the refrigerator making ice when you’re home alone, the only reason Pete noticed Glenn’s seemingly fascinating life is by peeping in on his class from outside the building. Watching this episode, I noticed that we never really see the Petes watching TV, playing video games, or doing anything that isn’t essentially a game or activity that they invented themselves. Sure, that could have been because buying rights to showing anything on TV was prohibitively expensive, but also it’s kind of neat. It’s nice that they’re not slugs. Then again, even a slug probably knows not to stick a piece of cereal up his nose. The stretch of school (or work, for that matter) between President’s Day and Easter really is soul sucking. Only the strong survive. Once you know that Michael Maronna tried not to blink in his one-on-one intros with the camera, you’ll always be looking for it. He does a great job in this episode. I don’t think I caught one eyelash flutter.